Almost a month on, what did the Singapore summit achieve? The first sitting President to meet with a member of North Korea’s ruling Kim family, Trump was confident that he had succeeded where the more measured diplomacy of his three predecessors – Clinton, Bush, and Obama – had failed. His devoted followers began chanting “Nobel Peace Prize” at a political rally even before his departure for Singapore. Trump himself declared just a week before the historic summit that “I don’t think I have to prepare very much” for his meeting with the North Korean leader. Perhaps a little preparatory knowledge of Pyongyang’s brinkmanship negotiating style might have been in order before giving the young North Korean leader something his more illustrious grandfather and father had long sought but were never able to achieve – face time on the world stage with the leader of the free world. But it seems that the dog ate the White House briefing books. Israel has, of course, legitimate national security concerns about North Korea’s nuclear development: Pyongyang has for years been playing nuclear footsie with both the Iranians and Syrians. This was most famously done with the construction of a Yongbyon-style nuclear reactor in the Syrian desert, which the Israelis removed in a surgical strike back in September 2007. This followed Israeli concerns being put on a backburner by Washington then very much focused on advancing the Six-Party Talks with Pyongyang. 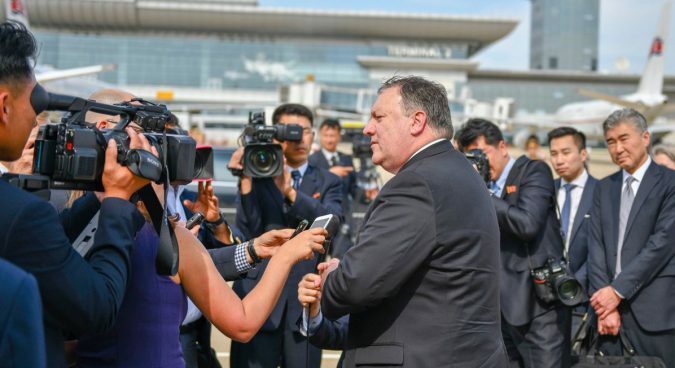 It comes as no surprise that Secretary of State Mike Pompeo, President Trump’s designated point man on North Korea, received a rather frosty reception during his recent follow-up trip to Pyongyang. The Young General, having secured the supreme prize of a meeting with the American President, chose not to see Pompeo this time around, reportedly choosing instead to visit a potato farm – even though he has personally greeted basketball bad boy Dennis Rodman during his numerous visits to Pyongyang. The Kim family is not always merely playing games when they turn up the propaganda. When Pyongyang informed a Vietnam War-weary Johnson administration, back in 1968 that they would hold the USS Pueblo crew until they received some sort of an apology, they did so for almost a year. When in 1976, a year after a war-weary Ford Administration had evacuated South Vietnam, North Korean forces told a U.S. and South Korean joint team to desist from cutting down a tree blocking UN forces’ view in the DMZ, their warnings were ignored. (The tree, the North Koreans insisted, had been planted by, North Korea’s founder Kim Il Sung.) North Korean soldiers then grabbed axes and killed two U.S. army officers. When the North Koreans threatened revenge for taking a hit in a military face-off with South Korea along the Northern Limit Line (NLL) in the Yellow Sea, they made good on their threat by torpedoing a South Korean military vessel in 2010, killing 46 South Korean sailors. 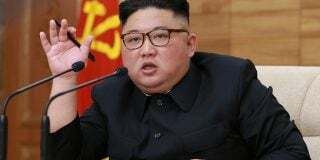 And just last year, having indicated weariness with the candid and often critical comments of his half-brother in exile, Kim Jong Un arranged to have him assassinated with chemical weapons in public view at a busy international airport. Do these actions look like mere bluffing? Kim had astutely already sold Washington the equivalent of the Brooklyn Bridge even before the Singapore Summit. In the lead up to the summit, he announced plans to shut down the Punggye-ri nuclear testing site. Hailed as a major breakthrough by the American administration, Punggye-ri was already seen a white elephant for North Korea’s nuclear program. Chinese geologists had reported in April that the site “had partially collapsed and was perhaps unusable,” according to the Guardian newspaper. “They had probably done a lot of damage to the site with the last test, so might as well get credit for a tunnel you don’t want to use,” observed Vipin Narang, a professor at the Massachusetts Institute of Technology. 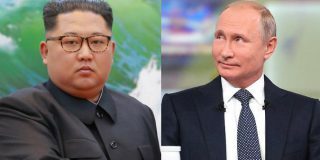 With Punggye-ri lying in close proximity to the Chinese and Russian borders, even the abrasive Kim could not risk further testing which could lead to leakage causing radiation sickness for Chinese and Russian citizens. And who needs Punggye-ri anyway? 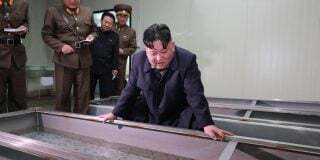 On June 27 – just a little more than two weeks after the summit that was supposed to make Americans sleep well at night – satellite imagery provided by the 38 North website indicated that “North Korea has made rapid improvements to the infrastructure at its Yongbyon Nuclear Scientific Research Center – a facility used to produce weapons-grade fissile material,” according to a CNN report. 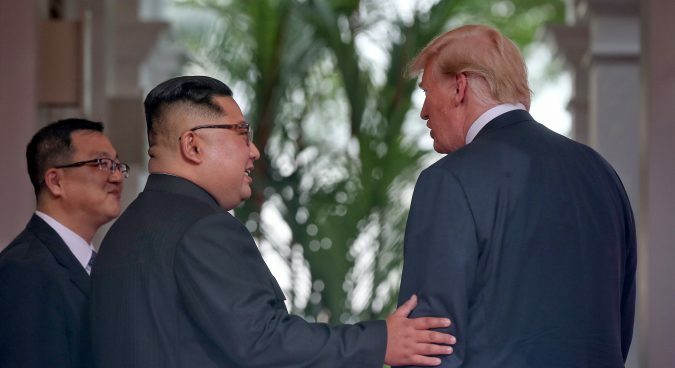 It was a summit that seemed to move forward North Korea’s unswerving goal throughout the Cold War and beyond to have a “nuclear free Korean peninsula” achieved by the removal of U.S. ground forces from the peninsula and the lifting of the American nuclear umbrella provided for South Korea’s defense. And then there was that photograph that made Pyongyang’s propaganda hit parade for over a 24-hour cycle: the Commander-in-chief saluting a North Korean general – a general whose major aim in life is to kill, if necessary, as many of the 28,000 U.S. military forces stationed in South Korea as possible. What did Donald Trump gain? 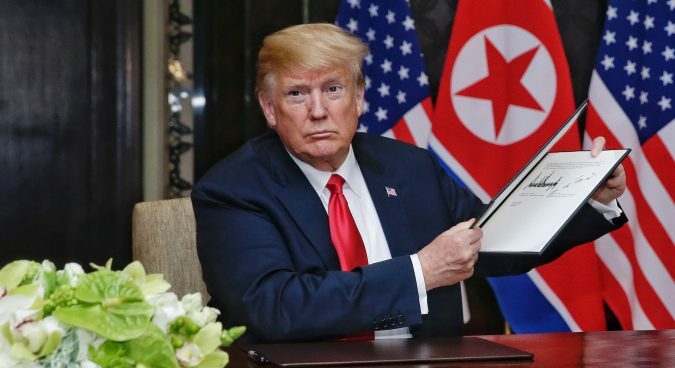 A photo op on the world stage which will be defined as his “Nixon-goes-to-China” moment; fantasies of a Nobel Peace Prize dancing in his head and those of his most ardent followers; and almost immediately verified backtracking by Pyongyang on whatever commitments Trump thought he garnered in Singapore to allow his fellow citizens to rest easy. Subscribe to read the remaining 1476 words of this article.